This EP, and band really, is a classic case of an artist or group that is easy to respect and hard to truly enjoy. Classic examples of this phenomenon can be seen with opera, ballet, or any artistic medium that lacks immediacy or takes a certain amount of effort to enjoy. In this particular case, it is a mix of eccentric vocals and awkward song pacing that serve to be shortcomings and highlights for Privilege, Pt. 1: On Death & Endearments. Every second of this record sounds amazing, and the sheer sonic scope of all four tracks is commendable. The band has obviously honed their craft, and it’s no surprise that they’ve gotten accolades galore over the past few years from their peers (ie. Los Campesinos!, Abe Vigoda, Owen Pallett) and critics (The Onion, Spin, NME) alike. Vocalist and songwriter Zac Pennington’s voice is something that you’ll either love or hate. Wobbly and markedly androgynous, it carries a song but can be unsettling and obnoxious. Privilege, Pt. 1 is very much a glam-pop record with maximalistic tendencies, which will appeal to a handful of indie music fans right off the bat. Some elements of the record stand out, including the great choral layering and subtle, yet effective string arrangements of “On Death and Endearments.” While these moments add to the listener’s enjoyment, the repetitiveness of “Found Drama I” detract from it. The quirky, awkward listen this record provides will be adored by some and hated by others. Whatever the outcome, Privilege, Pt. 1 is surely worth the twenty minutes it will take you to decide. 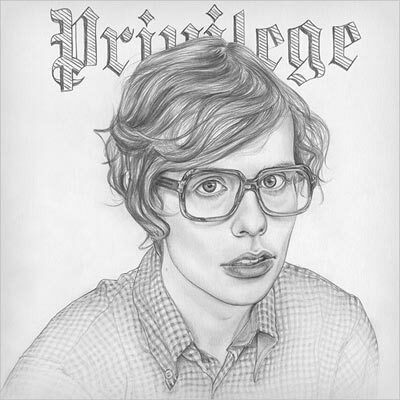 Also, since this is only the first of five limited edition 12″ EP’s, you’ll have something to anticipate as they’ll slowly be releasing all five as a full album, Privilege, in May 2011.